Frackman to kick off its official Queensland season this weekend with two special event Q&A screenings – Sunday 21 June, 6.30pm, Event Cinemas Robina + Monday 22 June, 6.30pm, Palace Centro Cinema. Frackman is like no other Australian film. It aims to spark a broad national conversation about coal seam gas development. Five years in the making, it not only entertains and engages, it also gives audiences the tools to get involved. Winner of ‘Best Film’ and ‘Best Environmental Film’ at the 2015 Byron Bay International Film Festival, and with sell-out sessions for its preview sessions in April, don’t miss this event screening to see what everyone is talking about. Frackman will begin its official Queensland season with two special event screenings featuring Dayne Pratzky (the Frackman himself – pictured) and the film’s Queensland producer, Trish Lake on stage for a special Q&A event following each screening. Tickets are now on sale now! Frackman will be screening at Palace Centro Cinema (James Street Fortitude Valley, Brisbane) from Wednesday 1 July and throughout the month. Please visit the Palace Cinemas website for updates on session times. Additional screenings will also take place at selected locations throughout Queensland. 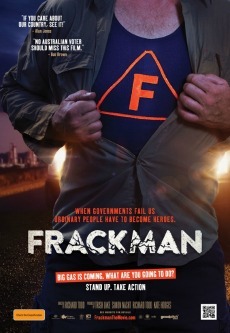 For more information, or to request a screening in your local area, please visit: frackmanthemovie.com plus like Frackman on Facebook. Frackman was proudly supported by Screen Queensland.